State-run ship-maker Garden Reach Shipbuilders and Engineers (GRSE), presently working on 19 ships, on Wednesday handed over the waterjet fast attack craft Tillanchang to the Indian Navy. "GRSE is handing over the waterjet fast attack craft to the Indian Navy. In addition, the shipyard is presently working on another 19 ships which will be delivered over the next few years. Our shipyard is at its peak in terms of utilisation of its facilities," GRSE Chairman and Managing Director A.K. Verma said. Verma said the company has been trying to "cut down the ship-building period" to five years from seven years for bigger ships. "For medium-size ships, we take about three years and take two years for manufacturing smaller ships," he said. GRSE had earlier built and delivered ten fast attack crafts to the Indian Navy during 2009 to 2011. Subsequently, the Navy placed order for four more water jet fast attack crafts as "follow-on" ships. The first two ships of the follow-on series, INS Tarmugli and INS Tihayu, were commissioned into the Indian Navy on May 23 and October 19 this year respectively. "The ship -- Tillanchang -- is built at a cost of Rs 80-90 crore," he said. Commanding officer of the newly-delivered ship Adit Patnaik and Western Naval Command's Chief Staff Officer (Technical) Sandeep Naithani were present to accept the ship. "The ship is most fit for coastal patrols, anti-piracy, anti smuggling and anti-terrorism activities," Patnaik said. Verma said the ship was indigenously built in terms of designs, materials and machinery used in it. "Most of weapons and censors are indigenous," he said. The ship manufacturer has so far delivered 99 warships to the Navy, Indian Coast Guard and Mauritius Coast Guard which is the highest number of warships built by any shipyard in the country, Verma added. 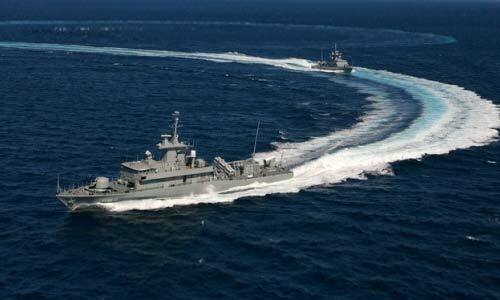 "The ship will be deployed at Karwar naval base in Karnataka at Arabian sea," Naithani said.